Sandi Savadier of Thandeka Africa found herself thoroughly enjoying a decadent slice of humble pie when she visited Camp Jabulani with her two children recently. As is sometimes the case with first time visitors to the lodge, Sandi had her own opinions about our operation, and wasn’t all that open to the idea of going on an elephant back safari. Having been down this road before, our charismatic ranger persuaded the reluctant guest to at least meet the herd before making a final decision. Knowing full well that all he had to do was get her down to the dam where the ellies were swimming in order to win her over. Before Sandi knew it, she was happily perched on top of Setombe with her 13 year old son Noah, and heading off on the ride of her life. This is Sandi’s firsthand account of her visit. “Your elephant back safari is going to be at two o’clock this afternoon,” our ranger told us, expecting our faces to light up with excitement. Instead I looked at him cynically and launched into a politically correct diatribe about moral dilemmas and how we shouldn’t ride elephants in the first place. I’d been invited to Camp Jabulani so that I could review it for my American clients. I accepted of course, it’s an exquisite lodge and I was happy to check it out. But I wasn’t so sure about the elephant riding thing. That’s something Americans do, I thought. Certainly not us locals! Feeling dubious, we set off to meet the elephants. I soon discovered we had no reason to be. 15 magnificent elephants, full of life, healthy, strong. We watched them for about an hour, playing in the water and throwing dust over their large bodies. Then the handlers came, lined then up, and we climbed on. And my dilemmas went out the window. What an extraordinary thing. To ride an African elephant in the wild. Silent, soulful. Babies walking by their mothers’ sides. I had a lump in my throat as we walked. The elephant handlers are all from Zimbabwe. And the story goes that 15 years ago a Zimbabwean farmer was given 3 days to ‘vacate’ his farmland. He had a place to go to. His elephants did not. Through an ‘elephant network’ he got hold of Lente Roode, who has a farm near Hoedspruit. Within a few days Lente had his elephants and Camp Jabulani was born. My elephant was Setombe. She’s a strong mother but loves the company of Bulls – like me! While walking, she constantly called to her babe, trumpeting when he didn’t come back quickly enough. When we bumped into the wild elephant herd, Setombe was first to flap her ears and charge straight for them, telling them in no uncertain terms to move away. I loved her strength, her courage, the fact that she had no fear – unlike me! It’s an astonishing experience, and absolutely impossible not to fall in love with them. At the end of our stay – I was a total convert. It’s something everyone should try. Among the abundance of holidays we have in this country – I propose a new one. 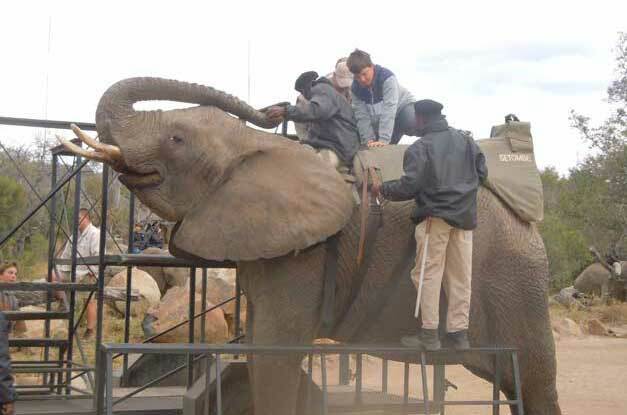 ‘Ride an African Elephant at Camp Jabulani Day’. It could change your life.